I, Robot not only has very little in common with the Isaac Asimov book on which it is very, very loosely based, it also takes one of that book’s central messages and stands it completely on its head — and a part of me couldn’t be happier. 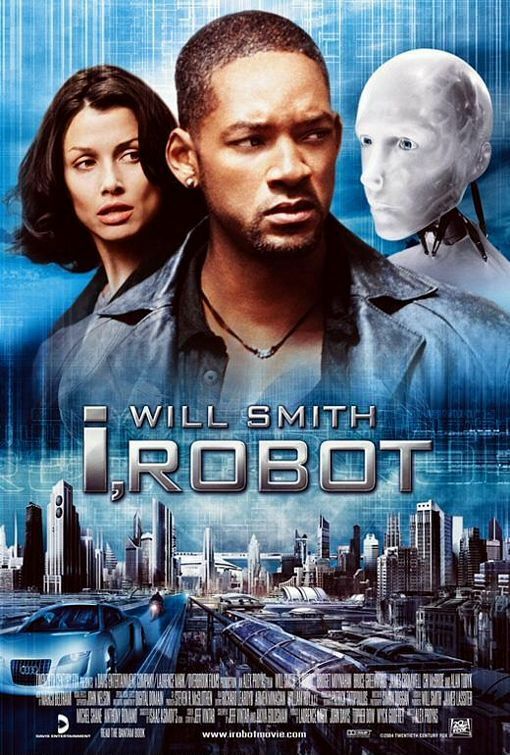 Directed by Alex Proyas (whose moody, noir-ish sci-fi parable Dark City was my favorite film of 1998) from a script by Jeff Vintar (Final Fantasy) and Akiva Goldsman (Batman Forever), I, Robot is a run-of-the-mill special-effects-heavy Will Smith action flick that plays on our presumed fear of robots and the tyranny of logic. In this film, the only good robots — and no doubt the best people, too — are the ones that learn to follow their hearts and make illogical decisions. For an atheist like Asimov, such machines must have seemed like an improvement on the God of Judeo-Christian belief, who allows people to harm each other for reasons unknown. But I find Asimov’s conclusion more chilling than promising. What if these all-powerful robots malfunctioned or changed their programming to permit the harming of humans? What if humans, living in a world of guaranteed comfort and no real suffering, lost the capacity for spiritual growth? So, naturally, I could not help but smile when it became apparent that the people behind this movie also found Asimov’s ideas somewhat nightmarish. Alas, in order to express this nightmare in ways that will be obvious to the average moviegoer, they have to make the machines stupid, and the people even stupider. The robots abandon all sense of subtlety, which you might think would be the more logical approach, as they openly attack Detective Spooner (Will Smith) in a bid to prevent him from exposing the conspiracy that he just knows is there; and the cops and scientists who work with Spooner have a blind faith in the robots that is more than a little naïve. And then there is Smith’s performance; his occasional sullenness suggests he is itching for another Ali-like chance to prove his acting chops even as he slums his way through another high-tech shoot-’em-up. The result is a film in which the story and the style seem to be at odds with one another. Like the robots in some of Asimov’s stories, I, Robot is caught between conflicting impulses, and it ends up paralyzed.